Comfort clothing that doesn't compromise on style? Check! Dress your blossoming bump in stylish and supportive clothing from the likes of Topshop, New look and Dorothy Perkins. Namshi brings you everything you need to stay stylish throughout your pregnancy. Finding maternity clothing under one roof has never been easier, with our full collection of wardrobe staples that sees you through day and night in style. Comfortable maternity dresses and skirts offer the perfect choice for work, evenings out and special events. Flattering blouses and tops accentuate your bump without restrictions, working well with our pregnancy pants, leggings, and jeans. For cooler weather, we also offer a collection of jackets, coats and knitwear essentials. 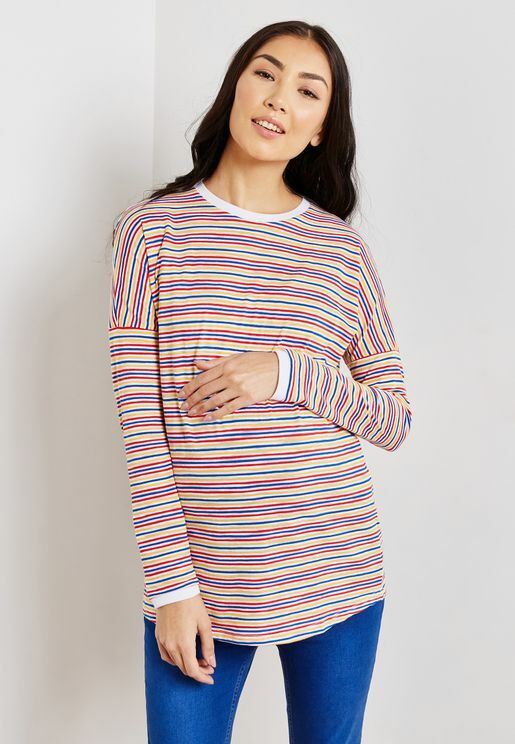 We offer an excellent selection of basics from leading brands such as Cotton On Body, Dorothy Perkins, New Look, and Topshop. In addition to our pregnancy clothing, we also stock a range of lingerie and nightwear that is specially adapted to your changing body. With comfy underwear and gorgeous maternity clothes, you will be able to continue glowing throughout each trimester. Browse our collection of maternity wear essentials and start planning your look today. Our range of pregnancy clothes keeps you looking and feeling great through your pregnancy, with many adaptive items that will see you through after the birth as well. With fast delivery and an easy shopping experience, finding maternity wear online is easier than ever. Buy maternity clothes online at Namshi to take advantage of our growing range.